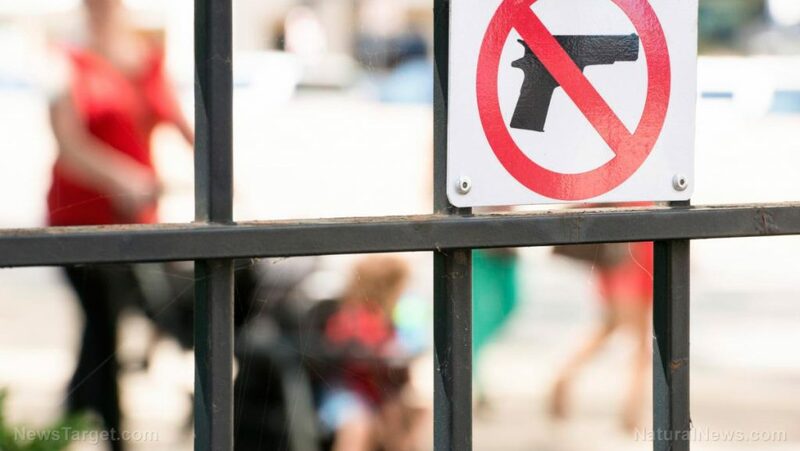 Abandoning all logic and reason, liberals have somehow convinced themselves that hanging “gun-free zone” signs in front of schools will somehow stop murderers from deploying guns there during mass shootings. Truly, you have to be completely disconnected from reality to believe that a silly sign is going to stop a murderer. Yet that’s exactly what liberals have claimed would work. 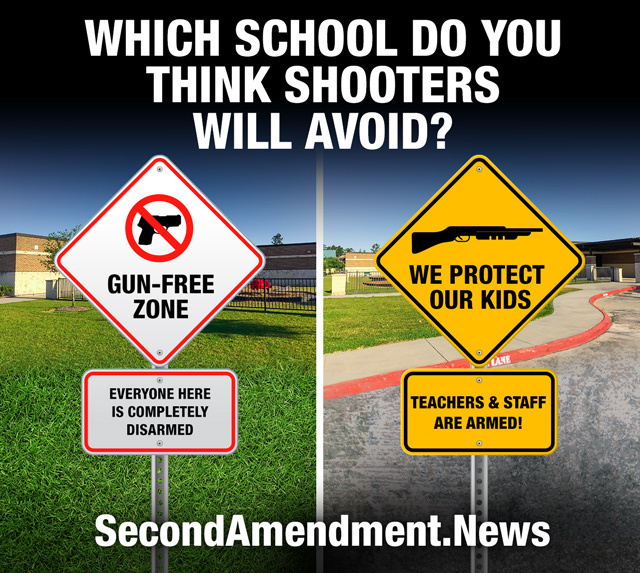 So they ran a grand experiment across America that I’ll call the “Gun-Free Zone Experiment” to see if those signs would reduce or eliminate school shootings. Guess what? In fact, “gun-free zone” signs turn out to be magnets for mass shooters (for all the obvious reasons). According to research published by the Crime Prevention Research Center, more than 98% of mass shootings occur in gun-free zones. From 1950 through July 10, 2016, only 1.6% of mass shootings took place in areas where guns were allowed to be legally carried. 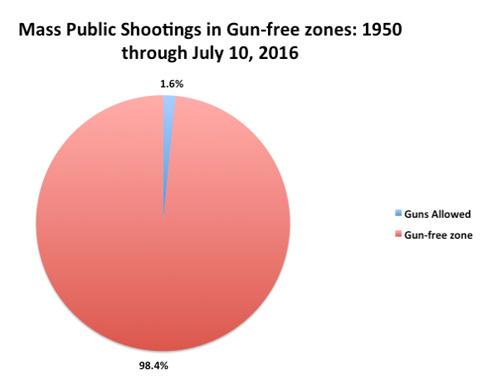 This chart tells you something simple but powerful: Criminals who decide to carry out mass shootings strongly prefer “gun-free zones” as their intended targets. I wonder why that might be? Could it be the fact that no one there is armed and capable of returning fire? This simple question has apparently never occurred to anti-gun liberals because, as I mentioned above, they are utterly incapable of engaging in rational thought when it comes to defending their own children from violent psychopaths. Anti-gun nut jobs want to turn the entire country into a grand “gun-free zone” … what could go wrong? Now that we know gun-free zones are death zones for law-abiding citizens — but easy shooting galleries for psychopaths — the same deranged left-wing lunatics who mass hallucinated the whole “Russian conspiracy” news hoax are demanding that every law-abiding citizen in America turn in their guns to the government, leaving only the criminals — who by definition ignore gun laws — armed and dangerous. This is the new evacuated logic of the Left: Make sure all the criminals have a monopoly of guns on the street, knowing that no law-abiding citizens are armed anywhere at all! Such a move would, of course, only embolden criminals to commit more robberies, rapes and murders. This, in turn, can be exploited by the Left to call for bigger government, turning America into a totalitarian police state run by left-wing control freaks. Of course, every time Leftists are invited to place “Gun-Free Zone” signs in their own front yards, they are horrified at the thought. Armed guards protect banks, air flights and sports stadiums… so why don’t Leftists want to protect their own children? The most astonishing realization in all this is how Leftists refuse to protect their own children by guarding schools. The very same people who think it’s great to have armed guards at banks, air flights, sports stadiums or even Disneyland somehow tell themselves that guarding their own children with security is a bad idea. How stupid is that? It’s so stupid that you have to be a Leftist to believe it. Yes to Alex F and KK German ! Oh for goodness sake, and do you think that arming the teachers is going to solve the problem? Really? What a load of BS! This article is written to create divisions! What a load of BS! I am seeing this over and over, but =why do supposedly free thinkers and people interested in alternative view points NOW align themselves as the “right”, the “conservatives”, and throw the “left”, the “dems” on the other side which creates more polarization? While perhaps practical matters call for arming to protect, cannot we advocate for a GUN FREE WORLD and a NUCLEAR WEAPON FREE WORLD as a target and worthy goal for a civilized free world?